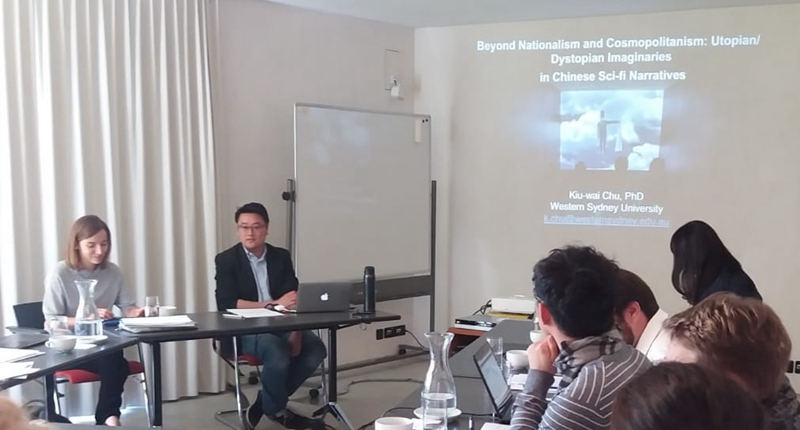 Between 3-6 October, 2018, Dr Kiu-wai Chu was invited to an international workshop on “Residual Futures: Rethinking Utopianism in Modern China” in Castasegna, Switzerland. Organized by Institute of Asian and Oriental Studies (Chinese Studies), University of Zurich, the workshop addressed the current turn of academic discourse and cultural representations towards “residual futures” – a conceptual figure that renounces the totalizing utopian imaginations of the previous century. The workshop was attended by 15 international scholars in China studies, who were there to present their latest work on past and present cultural representations of Chinese utopian visions – how they circulate, and whether they support, supplement, or challenge the current official futurology as propagated in the Belt and Road and the China Dream narratives. In Dr Chu’s presentation, he juxtaposed science fiction writer Liu Cixin’s utopian story “The Micro-Age” (1999) with the works of Post-1980s writers and artists, in particularly Hao Jingfang’s sci-fi stories in The Other Shore of Humanity (2017); Sun Xun’s art series The Republic of Jing Bang (2013) and Lu Yang’s video series “Electromagnetic Brainology” (2017). Dr Chu identified the changing perceptions of nationalism and cosmopolitanism reflected in the works of the two generations, and argued that, while the works of Liu’s generation are characterized by fictitious worlds that see nationalism and cosmopolitanism as means towards attaining utopian ideals, the Post-80s think otherwise. To the latter, their postmodern utopian imaginaries lie more on humanity’s freedom and resistance against the power and control exerted by technology and artificial intelligence, which they imagine would increasingly dominate human society in the near future. Other speakers at the workshop included leading international Sinologists Wendy Larson, Andrea Riemenschnitter, William Callahan, Carlos Rojas, among others.